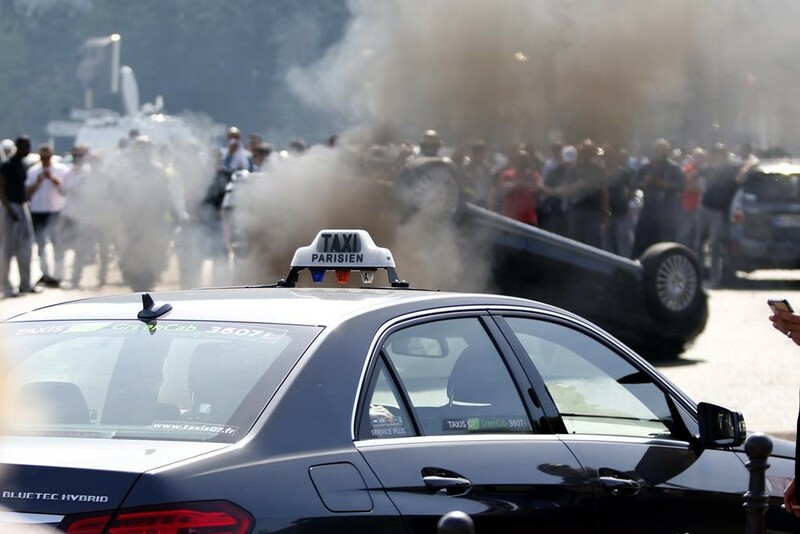 French taxi drivers pulled out the throttle in an all-out confrontation with the ultra-cheap Uber car service Thursday, smashing livery cars, setting tires ablaze and blocking traffic during a nationwide strike that caught tourists and residents alike in the mayhem. Travelers going to and from the airport were forced to walk alongside highways with their bags, while others had their cars set upon by striking taxi drivers. Taxi drivers justified their rage, saying Uber’s lowest-cost service UberPop was ruining their livelihoods. Interior Minister Bernard Cazeneuve rushed back from a trip to Marseille to meet with taxi unions, declaring afterward that UberPop must be shut down and its vehicles seized if caught by police carrying passengers. He said 70 vehicles had been damaged around France in Thursday’s protests and 10 people were arrested. This article appeared in print on page 3 of the June 26th, 2015 edition of Hamodia.